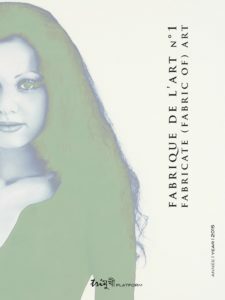 With each new issue of Fabricate (Fabric of) Art • Fabrique de l’Art, you have something to do through out the year. The printed book (730 gr., 28 x 20 cm., 192 pp.) is to be read and look at slowly, by small bits, a few pages at a time. And then, once stimulated, your mind works, wanders, derails or launches into multiple paths. A few days later, you may return to the book, resume your exploration of the words or the images, make leaps, create links. And you will not stop, year-round, until the next issue: a way to continuously celebrate the arts as they are fabricated today. 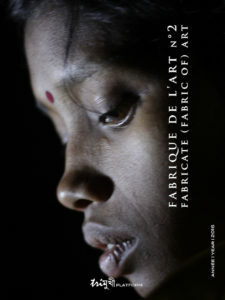 Fabricate (Fabric of) Art • Fabrique de l’Art is published by Trimukhi Platform. 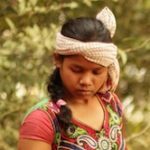 It is printed in Kolkata, India, both in English and French. It involves philosophers, writers, sociologists and artists from all over the world. To enjoy thoroughly the book series you may subscribe for 3 years. 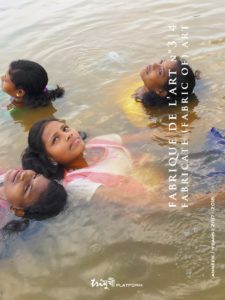 Launched in Paris (France), Kolkata (India), Chicoutimi and Montréal (Canada), the first issue of FABRICATE (FABRIC OF) ART • FABRIQUE DE L’ART contains texts and digital works by 21 artists and scholars from India, France, Spain, England, Italy, Switzerland, Portugal, Mexico, Colombia, Argentine, Ecuador and Canada: Rolf Abderhalden, María José Argenzio, Henri Barande, Héctor Bourges, John Butcher, Jean-Frédéric Chevallier, Joseph Danan, Samantak Das, Miguel Ferrao, Rodrigo García, Emilio García Wehbi, Denis Guénoun, Nilanjana Gupta, Bidyut Kumar Roy, Chittrovanu Mazumdar, Matthieu Mével, Madhuja Mukherjee, Julien Nénault, Gaston Roberge s.j. and Víctor Viviescas. Published with the support of the Publication Assistance Programmes of the Institut français, the second issue of FABRICATE (FABRIC OF) ART • FABRIQUE DE L’ART contains short essays, poetical texts and visuals works by 23 artists and scholars from India, France, Pakistan, Brazil, UK, Italy, Belgium, Mexico, Japan, Colombia, US, Tchad, Rumania and Canada: Lorena Ancona, Max de Carvhalho, Romeo Castellucci, Pallabi Chakravorty, Jean-Frédéric Chevallier, Joseph Danan, Nabaneeta Dev Sen, Sabina Giliani, Nathalie Heinich, Koulsy Lamko, Philippe Manoury, Matthieu Mével, Izumi Miyazaki, Ikue Nakagawa, Emmanuelle Pireyre, Jean-Paul Quéinnec, Soumya Sankar Bose, Rogelio Sosa, Pierre Soulages, Bruno Tackels, Sanda Voïca. The purpose is concrete and simple: stimulating the thought, awakening desire for the arts. Published with the support of the Publication Assistance Programmes of the Institut français, àn the occasion of the ten years of Trimukhi Platform, the third/fourth issue of FABRICATE (FABRIC OF) ART • FABRIQUE DE L’ART (designated double issue because to go to ten is to move to two digits) offers analyses, testimonies, conversations, reflections, images that give a lively account of this singular and joyous adventure which started in West Bengal with a few Santhal dance steps, one morning of August 2008, in the village of Borotalpada. It contains short essays, manifestos, poetical texts and visuals works by Barbara Cassin, Jean-Frédéric Chevallier, Joseph Danan, Denis Guénoun, Élodie Guignard, Nicolas Idier, Fui Lee Luk, Patrice Maniglier and Ariane Mnouchkine (France); Bhudray Besra, Susmit Biswas, Samantak Das, Chintamoni Hansda, Dhananjoy Hansda, Dulal Hansda, Joba Hansda, Ramjit Hansda, Salkhan Hansda, Sukul Hansda, Surujmoni Hansda, Anjum Katyal, Priti Paul, Sunandan Roy Chowdhury and Pini Soren (India); Jon Cook (UK); Cuqui Jerez (Spain); André Éric Létourneau (Canada) and Ikue Nakagawa (Japan).